When the defense appropriations budget was passed by the US Congress for Fiscal Year 2004 and was signed into law by the President, it contained a provision that changed the name of a Defense Department agency. The National Imagery & Mapping Agency (NIMA) changed its name to the National Geospatial-Intelligence Agency (NGA). In line with this change, NGA adopted a new seal. As the National Imagery and Mapping Agency becomes the National Geospatial-Intelligence Agency (NGA), a new seal captures the vision: "Know the Earth ... Show the Way." The globe symbolizes the totality of the mission. Its pixilation symbolizes the Agency's background in imagery analysis, while the grid evokes mapping. The radiating star above the Earth is showing the way toward new concepts, technology and products. The day and night depiction suggests the round-the-clock nature of NGA's work. The new seal includes a red compass, also found on the CIA seal. The compass or star, as some call it, has 16 points. These represent the worldwide search for geospatial intelligence and the navigational mission. The current agency flag has been in use since the current seal was adopted in early 2008. The biggest difference between this seal and the old one is the inclusion of the words "United States of America" at the bottom of the seal. The border on the NGA flag was thinned when the agency's seal was redesigned (and hence the flag was redesigned) in 2006. The agency has actually been through two flags since its transition from the National Imagery and Mapping Agency (NIMA) to the National Geospatial-Intelligence Agency (NGA) in December 2003. Both flags have used the same design elements; the only difference has been in the agency seal featured on the flag. An interesting variant of the standard executive branch Senior Executive Service flag, made specifically for the National Geospatial-Intelligence Agency director. The red border mirrors that of the agency flag. www.defense.gov/dodcmsshare/photoessay/2010-08/hires_100809-D-7203C-012a.jpg. In August 2014, an official announcement said that the "Director's flag" (so called because NGA used the flag to represent the Director of NGA exclusively and not as an SES flag) had been retired after a review of Defense Department guidance on the use of civilian flags. Doing some research, I found a copy of that DoD guidance online - Department of Defense Instruction No. 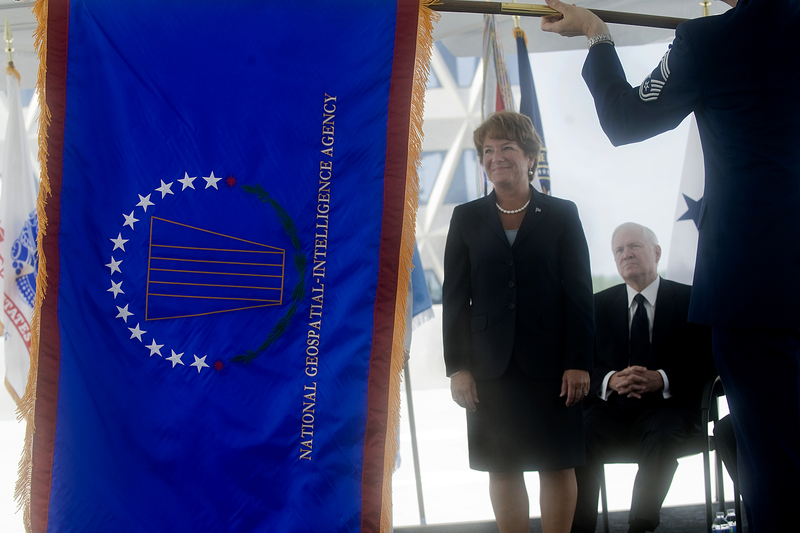 1005.15, dated 6 August 2013, with the subject "DoD Civilian Flags" www.dtic.mil/whs/directives/corres/pdf/100515p.pdf. The instruction describes how civilian rank and positional flags are to be used within the Department, and provides graphics of the approved flags. Of note, the NGA Director's flag was not included among the list of approved civilian flags, though the Army and Air Force SES flags are included. Additionally, the instruction specifically states that civilian rank and positional flags are for office display only. I believe those two points contributed to NGA's decision to retire the flag completely.